With over 30 million songs stored on its database, Spotify is one of the largest streaming music services on this planet. You can look for any song on Spotify. From the very old songs like the original version of Don’t Dream It’s Over from Crowded House to newer songs from Coldplay or your favorite bands. Spotify is used by millions of people in about 78 countries. Spotify itself adopts a freemium business model. Anyone can listen their favorite songs for free on Spotify, but with some restrictions compared to the paid version. The paid version of Spotify allows you to download your favorite songs for offline listening. Meaning that you can listen the downloaded songs without internet connection. If you can’t afford Spotify monthly subscription and want to download your favorite songs for offline listening, you can do so using third party apps. Of one the third party apps you can use is Tuneskit Spotify Music Converter. Tuneskit Spotify Music Converter is a DRM removal software that you can use to convert songs from Spotify to a wide range of audio formats. From MP3, MA4, MAB, AAC to WAV. You don’t have to be a paid member of Spotify to use Tuneskit Spotify Music Converter because the tool is intended to help you to download your favorite songs from Spotify for free. How Tuneskit Spotify Music Converter works? The way Tuneskit Spotify Music Converter is pretty simple. It will download the files of the selected songs and convert them into the specified format. Before starting to convert, you can set the bit rate of the songs via the Preferences menu. Tuneskit Spotify Music Converter uses the lossless algorithm so the sound quality of the downloaded songs remains great just like the original songs on Spotify. It takes no technical skill or knowledge to use Tuneskit Spotify Music Converter. You just need to copy the URLs of the songs/albums you want to convert from Spotify to the available box on Tuneskit Spotify Music Converter. Or, you can also use the drag-and-drop feature offered by this tool. 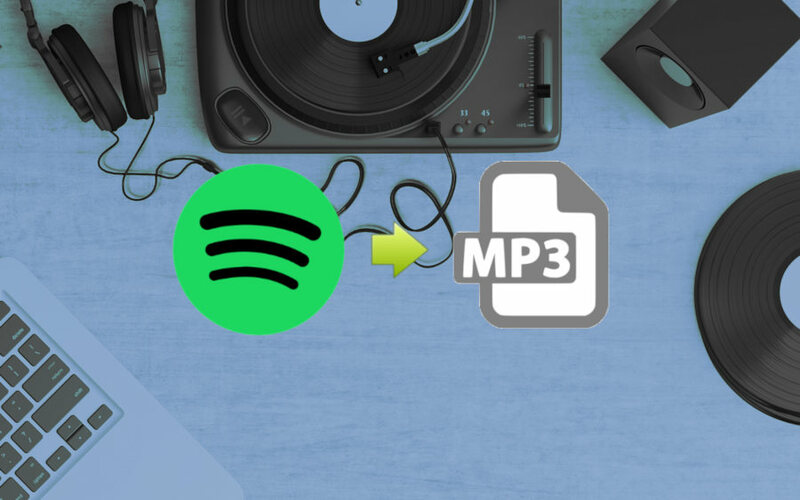 You don’t need to manually connect your Spotify account to Tuneskit Spotify Music Converter as it will automatically connect to your Spotify account upon launching. One thing you need to know upfront, Tuneskit Spotify Music Converter is a paid app. You can get this app for $29.95. Even so, it is much saver than Spotify as you can download as many songs as you want. Plus, you don’t need to spend a monthly budget which is not good if you already have too much bills to pay within a month. 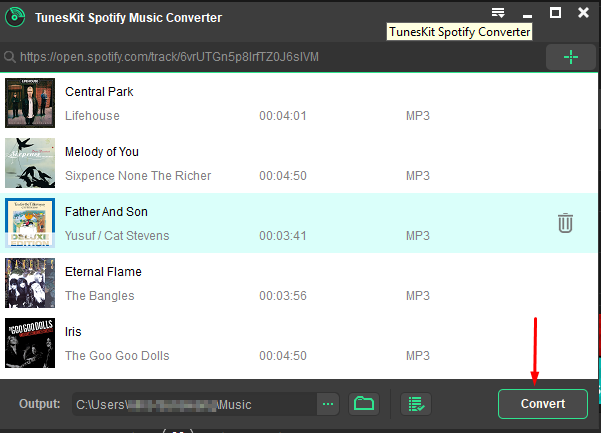 Tuneskit Spotify Music Converter itself is available for Windows and Mac. Especially for Windows users, there is a trial version you can make use of to figure out if this tool really work. But, the trial version only downloads the first minute of each song. But, it is more than enough to check if this tool is work or not. 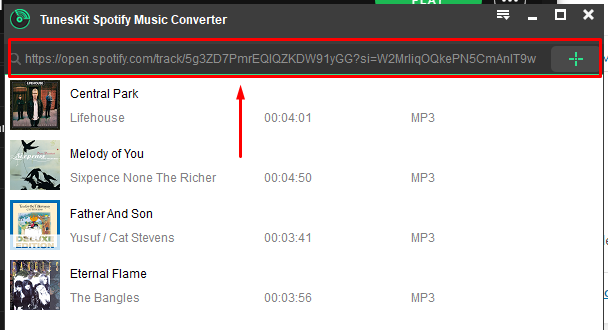 You can download the binary file of Tuneskit Spotify Music Converter on its official site. To install it, simply double-click the downloaded binary file of Tuneskit Spotify Music Converter (EXE file if you use Windows and DMG file if you use Mac). Accept the user agreement and click the Next button to proceed the installation. 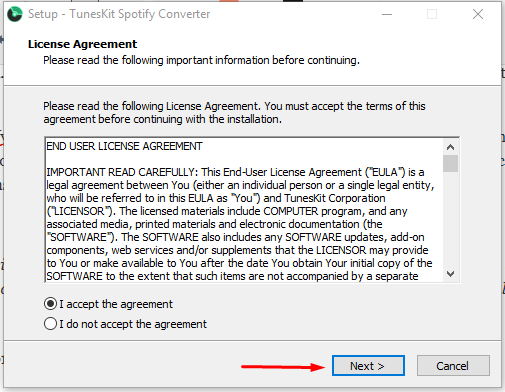 Note for Windows users: Tuneskit Spotify Music Converter only works with Spotify that was installed via binary file (EXE). During my trial, it didn’t work with Spotify that was installed via Microsoft Store. If you use Windows 10, you can download the binary file of Spotify for Windows on this page. You can use Tuneskit Spotify Music Converter to convert individual songs or the whole album at once. As mentioned earlier, it takes no technical skill or knowledge to use Tuneskit Spotify Music Converter. You can simply copy the URL of the song/album you want to convert to the available box and click the plus button to add it to the queue. Or, you can also use the drag-and-drop feature to add the song/album to the queue. Once you are done adding the songs to the queue, you can set the output format as well as the bit rate before converting them. To do so, click the three-line button right next to the minimize button and select Preferences. On the Preferences page, switch to Convert tab to select the output format as well as the bit rate. Click the OK button once you are done making the settings. Set a destination where you want the converted songs to be stored by clicking the three-line button next to the folder icon on the bottom of Tuneskit Spotify Music Converter. 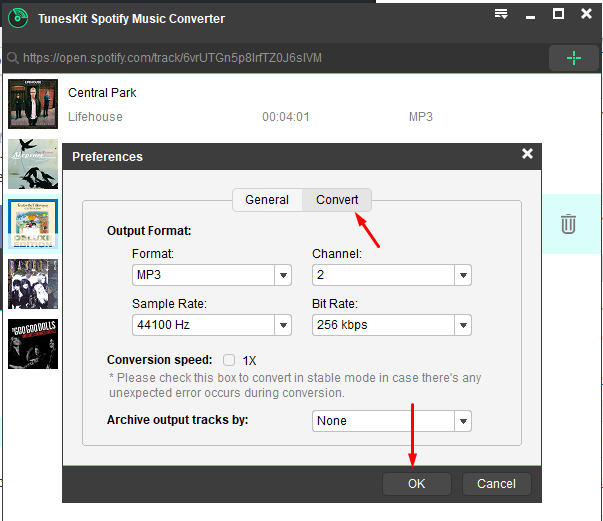 Lastly, click the Convert button and Tuneskit Spotify Music Converter will be start working to convert your songs. 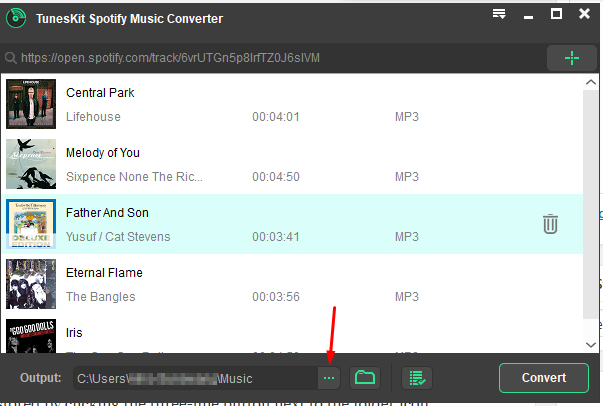 Wait until Tuneskit Spotify Music Converter is done converting and downloading your songs. Once done, you can open File Explorer (or Finder if you use Mac) and navigate to the folder you have specified. Or simply click the folder icon on the bottom of Tuneskit Spotify Music Converter. You can now start listening your favorite songs using conventional music player without internet connection. With over 30 songs, Spotify is one of the best resources for music addicts to find songs. You can find songs from any genre and era on this service. Spotify itself is a streaming music service. Meaning that it requires an internet connection to work. Spotify doesn’t allow you to download any song, unless you are a paid member. But with Tuneskit Spotify Music Converter that restriction doesn’t apply. You can use Tuneskit Spotify Music Converter to download songs from Spotify without needing to upgrade your account to premium. This tool uses lossless algorithm to ensure the sound quality of the downloaded songs as good as the original songs on Spotify.